The 85 young women assembled in the stately Hilton Room of New York City's Waldorf Astoria Hotel on Tuesday, October 19, came for a discussion of career paths, but also to satisfy their curiosity about the "Council for Women of Boston College" that had sent the invitation. 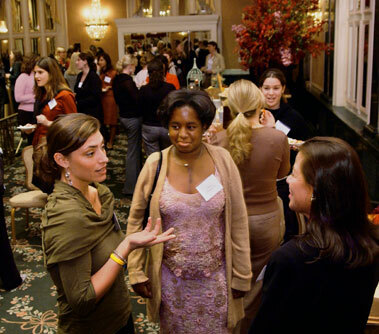 The council—nearly 50 women strong—was formed in 2002 on the recommendation of a trustee-commissioned task force that studied the disparity between the growing numbers of female graduates and the persistent low level of alumnae involvement with BC in everything from volunteering to reunion attendance. Its charge is to develop initiatives that "further the role of women" as alumni leaders who "help shape [BC's] future." "A university can't thrive unless its graduates remain personally invested, and for some reason, men do that better than women do," said Kathleen McGillycuddy NC'71, herself a University trustee and, until recently, executive vice president for FleetBoston Financial. McGillycuddy cochairs the council with fellow trustee Cynthia Egan '78, an executive vice president and director of retirement income services for Fidelity Investments. McGillycuddy admits she didn't reconnect with BC until three decades after graduation. An evening of career talk sponsored by the council and aimed at women, she believes, is one way to bring young women to the table. For two years, the council has been sponsoring "Beginning the Journey" panels on the BC campus, to connect undergraduate women soon to embark on their career paths with women who have successfully traveled some way down their own. The Waldorf panel, the council's seventh effort, is the first to take place off campus, and the first to be aimed at alumnae rather than students. In her introductory remarks, McGillycuddy, who served as moderator, noted that soon, for the first time, Boston College's alumni base would be more than 50 percent female. The audience, composed primarily of 21st-century graduates, might be used to outnumbering their male counterparts, she said, but the four panelists (all founding council members) could remember a very different Boston College. "It was a man's school," said the first speaker, Susan Gianinno '70. Yet, paradoxically, she said, women pursuing high-powered careers were so rare that no one bothered to discourage her when she began her career in advertising. Last year, she became the first female CEO of Publicis USA, a branch of the French-owned Publicis Groupe, the world's fourth largest advertising and communications conglomerate; prior to that she'd been chair and president of D'Arcy Worldwide and CEO of J. Walter Thompson New York. "I'm getting a little tired of being the 'only' and the 'first,'" she said, urging the audience to appreciate their relative abundance of role models. "Learn from their successes and their mistakes," she advised. The second panelist was Cathy Brienza NC'71, a founding principal of the private equity fund WallerSutton 2000. The financial executive/entrepreneur recalled that when she first interviewed on Wall Street, the question she heard most often after "Can you type?" was "Don't you want to have a family?" Indeed, Brienza did have one child, but candidly credits "a wonderful housekeeper and nanny" for making career and family possible. Then there was nurse practitioner Ann Finck '66, the mother of seven children spanning 16 years and two marriages. The flexibility of her profession was a boon, she said, but juggling responsibilities became an "art form," especially when she chose in her forties to pursue a graduate degree. Still, Finck said her goals were reached with the help of, not in spite of, her family. University Trustee Darcel Clark '83, a criminal court judge in her native Bronx, consciously took a different path: "It's okay not to have kids, too. Women don't talk about that." She finds ample fulfillment in her roles as a public servant, an aunt, and an NYPD detective's wife. Clark knows a lot about "only" and "first." She was the first in her family to go to college, and in 1982 she was the University's first Martin Luther King, Jr., Memorial Scholarship recipient. The audience's applause seemed to be as much for the panelists' honesty as for their resumes, and this open spirit carried through the Q&A session. While some questions were technical (e.g., "What advice do you have for someone who wants to start her own business? "), many were personal, even confessional. Cara Cannella '01, who recently left a job at a magazine to pursue an MFA in nonfiction writing, raised her hand to say she was "scared to be 30 and thousands of dollars in debt." Clark's frank response: "I'm still paying student loans back, and I'm a judge… I thought I might as well invest in what would make me the most happy." Another anxiety-tinged question came from freelance fashion stylist Catherine Sheehy '01, who said earnestly, "I don't want to be identified by my job. It's not an important job, I don't think. It's not saving lives." After a pause, she added, "But I'm really good at styling!" "And we need you!" a panelist jumped in, to general laughter. "You will have so many opportunities to do meaningful things in your job," Gianinno told her, pointing out that for herself advertising has been an avenue into philanthropy. Heads nodded vigorously when Lauren Poile '01 stood in the front row to comment that female supervisors weren't necessarily more understanding toward female employees. The panelists offered several theories: Perhaps the proportionately lower number of women who are bosses makes the difficult ones stand out more; or maybe it comes from a do-it-yourself work ethic born of their own career struggles. Brienza suggested that in the absence of a female mentor, a male supervisor with daughters of his own could be a sympathetic source of guidance. "No one's entitled" to a mentor, Clark interjected, and expecting those who have gone before to smooth your way may be the wrong attitude. Rather than asking for help, she said, try getting to know a busy senior coworker by offering to assist her. The final question, and the one the organizers must have been hoping for, came from Helene Norton-Russell '00, who wanted to know how she could get more involved in council activities. "When I got this invitation, I was thrilled," she said. Afterward, nearly everyone remained for the reception. Katherine Staab '02, a librarian, approached panelist Finck to compare notes on working in a traditionally female field. Nearby, high school teacher Rebecca Lohse '01 commented that she wished Judge Clark would come talk to her students. Council members intend to hold similar events in the coming year. Future plans also include creation of an alumnae referral network. Nicole Estvanik '01 is the assistant editor for American Theatre magazine in New York City.